Lomas Barbudal Biological Reserve, in Guanacaste, is a research model in the field of insects, since it is inhabited by lots of different species of butterflies and bees among others, and lots of them are considered to be endangered species. Thus, it is a paradise for scientists and researchers who study insects; that is why the Costa Ricans think of this park as Parque de los insectos (‘the insects park’). 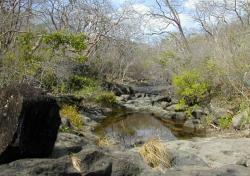 Besides, the reserve has a great variety of ecosystems, and one of the predominant ones is the dry tropical forest. In the park, the species that outstand the most are the cocobolo tree, the “cristóbal” tree (platymiscium dimorphandrum), and the gumbo-limbo, which are both odd and endangered species. Lomas Barbudal Biological Reserve also has an extended and varied wild fauna, formed by monkeys, squirrels, and badgers. Besides, the park offers different services: an information desk, a guided-tour service, and a small museum where it is possible to learn more about the different insect species. Lomas Barbudal Biological Reserve is an ideal place to relax and to connect with the calm Costa Rican nature. Hiking its different paths, such as La Catarata and La Caoba, you could discover its interior while you enjoy a pleasant walk. 21 miles from Liberia, Guanacaste, Costa Rica.